I woke up sleep deprived, downed some coffee, started to get Lennon and myself ready for our new-mom exercise class—sort of Pilates-light where you can stop and breastfeed or change a diaper as need be. The lack of sleep, among other things, had my mind behaving disgracefully. I was fixated on all the things I wish I could buy but cannot. It is unlikely I will ever make enough money to buy them. This is true not only because, at present, I’m a stay at home mom, but my profession, at best, is a labor of love. This made me feel regretful and I ruminated on this as we walked to our class. Somewhere over the bridge to Prenzlauerberg, my thoughts spiraled to turning forty this year and the expectations of what someone my age should have achieved. It’s so late, I thought, for me to be getting my PhD. Most people probably get one at thirty. If they do get a PhD at my age, surely they already have an acclaimed body of work behind them. My body of work to date is so scrappy and uneven. How come I don’t own my own house yet? Why do I live in a place where I can’t even speak the language; where the sun doesn’t even shine? Thus began a List of Envy in my head for everyone I knew (and some famous people I don’t know, also) who own a house, who have a lucrative career, who live someplace sunny, who speak German, who never experience envy, etc. At new-mom Pilates, things only got worse. The course is instructed in German, which normally isn’t a problem as I just look around and copy what all the other moms are doing. Today, the fact that I couldn’t understand the instructor created more self-punishment. Communicating poorly with the other moms in the class made me feel inconsequential and invisible to them. I felt dark blue on the walk home. I looked down at Lennon, hoping he would offer some support, but he had gone to sleep. Not even his pretty face cheered me, I’m ashamed to admit. Finally, I got groovy, turned outward, and asked The Universe for help: Please help me see better—because clearly I’ve lost sight—and get me back to grateful. That The Universe always listens, has been my experience. Home again, I took a nap with Lennon. A long, two-hour nap. Then, Nicholas came home from work and I told him all about the bad day I’d had. How it occurred entirely inside my head. He told me that I should have called him at work and let him know. He wanted to be able to help while the bad day was in effect. Later that night, we sat as a family and watched a television program that includes the singing of popular songs set at a high school and which shall remain nameless. During a highly auto-tuned rendition of a 1970s love ballad, I looked down at Lennon nursing in my lap and started to cry. He gazed up at me and smiled. The most amazing person I have ever met was married to me and curled at my side. Flooded with joy and glowing with grateful, everything else washed away. In 1933, renowned author F. Scott Fitzgerald ended a letter to his 11-year-old daughter, Scottie, with a list of things to worry about, not worry about, and simply think about. It read as follows. Source: Lists of Note by Shaun Usher on 1/19/12 via F. Scott Fitzgerald: A Life in Letters. 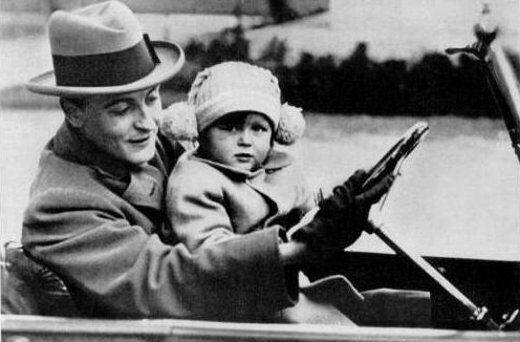 Photo: F. Scott Fitzgerald with his daughter, Scottie, in 1924. The identity shift that came with motherhood was extremely difficult for me, and I offer empathy and love. The Universe gives us what we need when we are open to receiving it, and you're open. Love you. Thanks so much, Kim. Wise words. Love you right back! Thanks for your transparency and your pithy reminder. I enjoyed reading how you used your awareness to separate the wheat from the chaff .... to separate your insidious time based mental monologues from your inherently joyful and rooted physical presence. What a bonus to have two males dedicated to reflecting your love back when you need to see it.